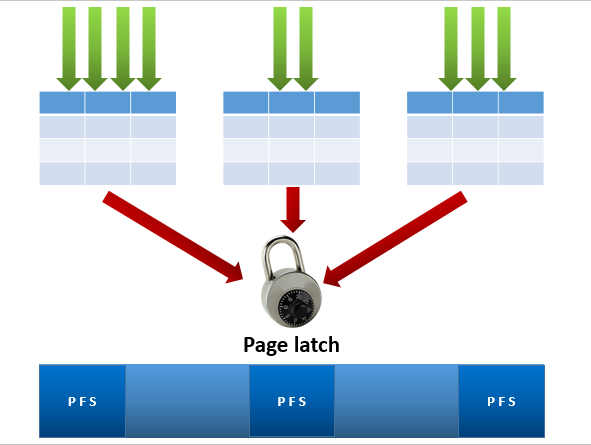 In the case of the page free space bit map we create more data files. 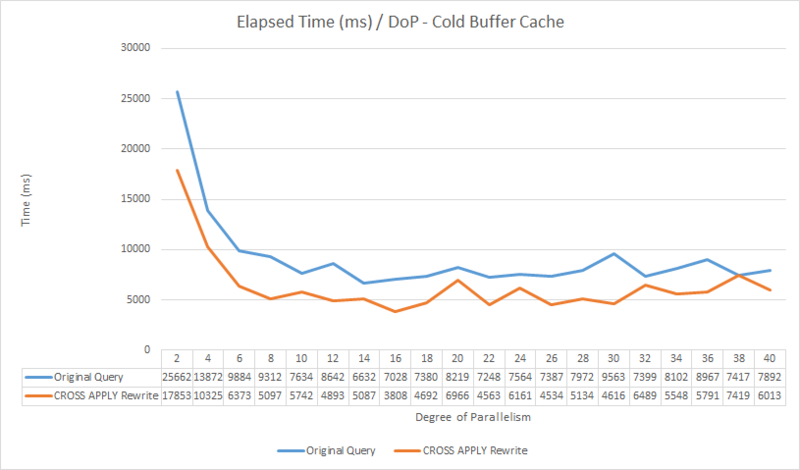 At a degree of parallelism of 6 and a warm buffer cache the query using the cross apply is over twice as fast as the original query. 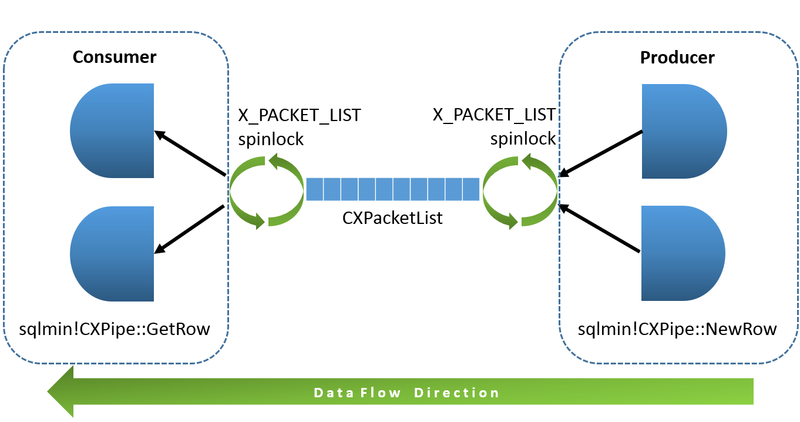 The theory is that replacing the re-partition streams exchange iterator with a nested loop join leads to better query scalability, this is the part of the stack associated with this iterator: Note that the stack displays the spin lock ( X_PACKET_LIST ) which is used to synchronize access to the CX packet list structure, however the CPU time consumed by this is a fraction of that used by the database engine at the time the trace was captured; 82,546 ms for the entire database engine and 100 for the re-partition streams iterator. Why Is The Re-Written Query More Efficient ? the sort that accounts for 42.5% of the plan cost has sorted 11,870,752 rows with an estimated row size of 89 bytes, totaling 1,008 MB of data, the next sort along accounts for 42.6% of the queries total cost and has a spill warning and has sorted the same number of rows with exact same average row size. 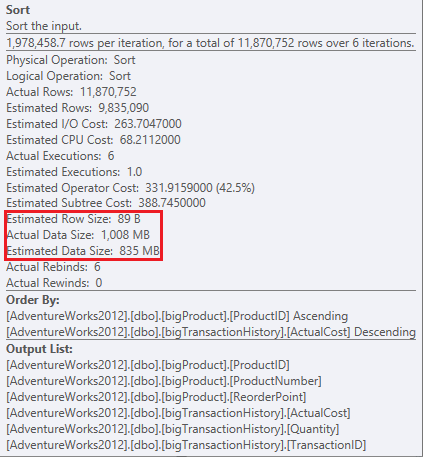 The CROSS APPLY is a T-SQL language construct of immense power, in this example by forcing the sort to take place on the rows retrieved from bigTransactionHistory before the join to the bigProduct table, two sorts of 1,008 MB have been turned into two sorts of 260 MB and have helped avoid a sort spill in the process. The key to this is the average row size, 23 bytes before the two tables are joined 89 bytes after. 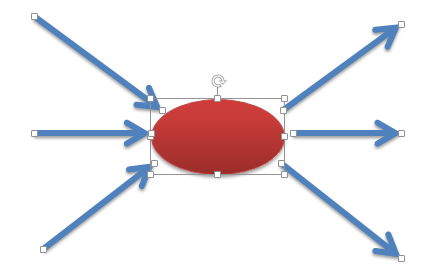 It is well documented that pushing filters into an execution plan as deeply as possible is highly desirable, in this example pushing sort iterators down into the plan via the CROSS APPLY has yielded a respectable performance gain at lows degrees of parallelism. 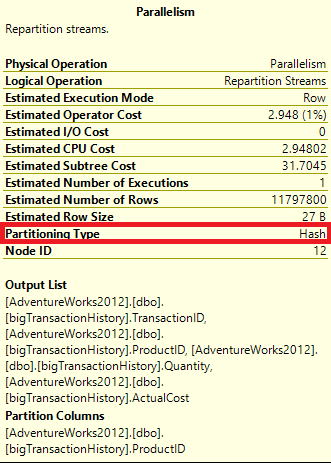 I set out writing this post with the expectation of being able to show the cost of the re-partition streams iterator, when in fact the facts proved the merits of sort iterator push down. This entry was posted in SQL and tagged Database, Microsoft SQL Server, Repartition Streams, Scalability, Sort iterator, X_PACKET_LIST. Bookmark the permalink. Intersting thing is also how the sorts scales. 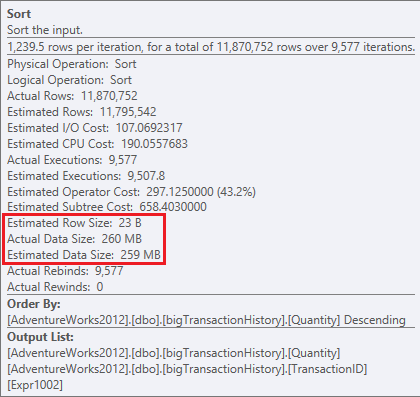 SQL Server sorts data via Quick Sort (in memory) and via Merge Sort (on disk). Quick and Merge Sort complexity is O(n*log(n)). So, in this case if you’re sorting 11,870,752 rows in one piece, then the „cost” is 11870752 * log(11870752) = 193,369,660. CROSS APPLY pattern devides that one big sort on 9577 smaller sorts (becouse it’s the number of products). So, now the sort „cost” is 9577 * (11870752 / 9577) * log(11870752 / 9577) = 84,509,671 and this is aproximetly 2.3 times cheaper then sorting one big set. Thanks for reading my blog and I’m glad you enjoy it. 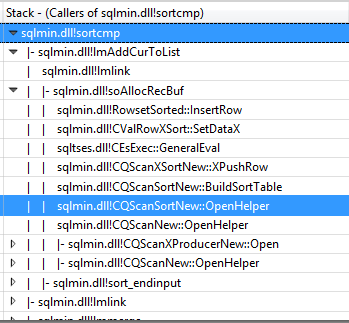 Referring to the tabular module / function call, the CPU time, sampled in ms across all cores for the sort in for the original query (sqlmin.dll::sortcmp) is 7986 ms compared 1,103 ms for the query with the CROSS APPLY , this is with a warm buffer cache and equates to an eight fold reduction in cpu time. This is the main reason I like using windows performance toolkit so much, because it allows these things to be quantified. How did you generate that stack display? Hi Cody, I use windows performance toolkit, this comes as part of the windows assessment and planning toolkit. Firstly you need to obtain an ETW trace, there is a GUI tool for doing this, but I prefer using the xperf command line, to investigate where you CPU time is going issue the following command xperf.exe -on PROC_THREAD+LOADER+PROFILE -StackWalk Profile, run your workload then issues an xperf -d mytrace.etl. Load this into the windows performance analyzer gui, load your public symbols, there is no need to change the path they are downloaded from, it should point to the Microsoft public symbol server by default. Then drag the “CPU analysis (sampled)” graph onto the analysis canvass, right click on the column headings in the table, select function, module and call stack and you are good to go . 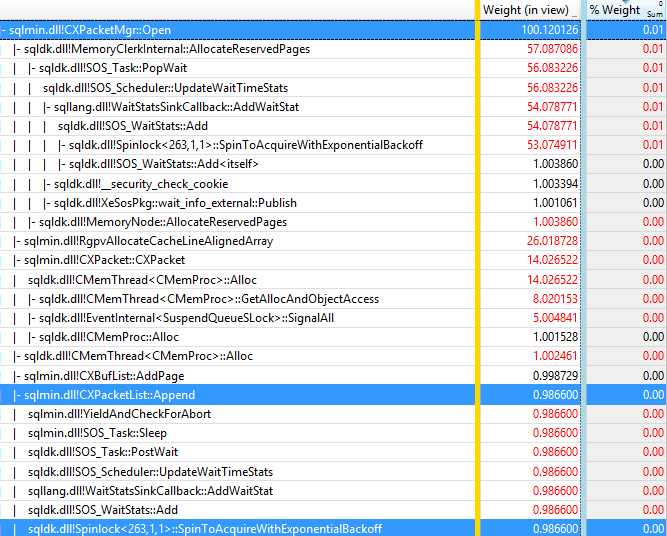 . .
You can check this defragtools show on CPU analysis from channel 9, it tells you all you need to know https://channel9.msdn.com/Shows/Defrag-Tools/Defrag-Tools-42-WPT-CPU-Analysis.